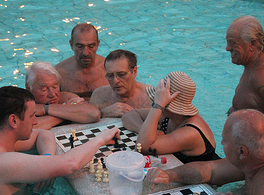 First time visitors in Szechenyi Bath often ask many questions. There are some misconceptions about the baths, e.g. some visitors think that you need to be naked in the baths (no, quite the contrary), that Szechenyi is a Turkish bath (no, it is not), where the pools are separate for men and women (they are not). Please read our FAQ, if you visit Szechenyi Bath in Budapest for the first time. It will give you a good orientation, and lots of helpful info to make your bath visit more relaxing, avoid multiple queues. CAN I … in Szechenyi Baths? Can children go to Szechenyi Baths? Can I take my kids under 10, or over 14? Will my teenager children enjoy the baths? Can I go to Szechenyi Baths with my toddler? Kids over 14 are very welcome to enjoy all pools. Children under 14 are not recommended to use the warm thermal pools of 36 degrees Celsius or more. Can I buy tickets in advance? Yes, you can buy your Szechenyi Bath ticket in advance, and avoid the hassle at the cashiers: fats track entry, comfort is just a click away. Pre-booked tickets entitle you to a full day visit, include a private changing cabin, and a private entrance at the Help Desk. Please note that online tickets cost an extra approx. 1 Euro, which means not having to stand in a queue / long line, as you will check in via our Help Desk, where our receptionist speak very good English. Can I book a massage therapy in advance? Yes, you can book your Szechenyi Bath massage in advance. What is more, it is best to book a massage in advance as same day massages are hardly available. Booking is via online: please note that we can only offer massage for bath guests, and confirm bookings that have been pre-paid. You can save some Euros if you book massage for 2 (massage treatment for 2 is in the same room). As massage in Szechenyi Bath is only for bath guests, each of our massage package contains a Bath Ticket (full day, Mon – Sun), with your own Private Changing Cabin. Can I wear swimwear in Szechenyi Baths? Can I wear a bikini? Can I wear a Speedo? Can I wear a wet suit? See our guide about the Dress Code of Szechenyi Baths In short, yes, you can and you have to. As the bath is mixed, all guests must wear a decent swim wear at all times. Can I rent swimwear in Szechenyi Bath? Yes, you can. See the prices, types of swim wear (follow the link please). Please note that the bath has an internal rental point for swim wear where only cash is accepted, and queues are building up easily at the rental office. You can save time to bring your own swim wear. Can I rent a towel in Szechenyi Baths? Yes you can, but we think it is best if you bring your own towel with yourself. Please follow the link for more details. Please note that the towels are best described as bath sheets. While the towel rental deposit is high, the actual rental fee of towels is low, but queues are often building up in the internal towel rental stations, where only cash is accepted. Another last minute solution is to buy a towel. Besides towels, bringing a pair of flipflops can be very convenient. Can I take photos in Szechenyi Spa Baths? Can I use my camera at Szechenyi Spa? Can I make video recordings of the baths, the outdoor pools like others on youtube? Can I smoke in Szechenyi Spa Baths? 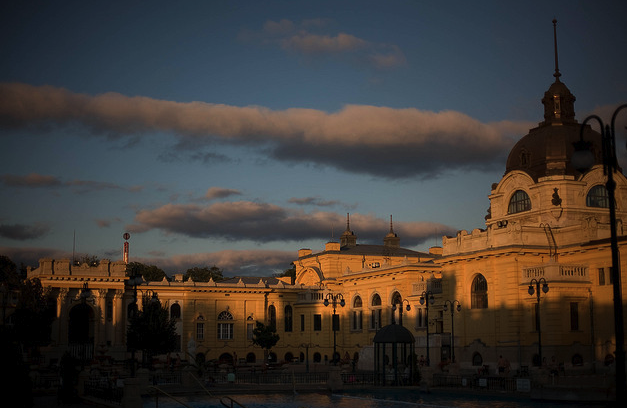 No, smoking is not allowed in Szechenyi Bath, which is considered to be a place of healing. Smoking is forbidden in all thermal baths in Budapest. Can I leave my bag, valuables somewhere safe in Szechenyi Bath? Yes, you can use your locker, your private changing cabin, or use one of the small safety boxes in Szechenyi bath. Can I bring food and drink to Szechenyi baths? You can bring your own food, and you can bring in non-glass beverages too (the bath is maintaining a splinter free zone). But if you get hungry, you can visit the simple cafeteria in the baths to buy some warm foods and cold foods (nothing fancy, plastic plates, affordable prices, canteen style self service). 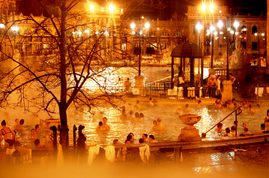 Can I visit Szechenyi Bath at Christmas? Yes, the baths and pools are open at Christmas too. 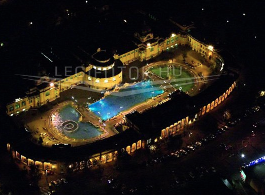 Where is Szechenyi Spa Baths? Szechenyi Spa Baths is close to the city centre of Budapest: by M1 metro (underground) you can easily get to the world famous bath complex in 15 minutes from the heart of the city, i.e. from the transit hub square called Deak Square (Deák tér), where all Budapest metro lines meet. Szechenyi Baths is in the City Park, a 5 minute walk from Heroes’ Square (you know, the Heroes’ Square with the tall monument with an angel on top? It is often seen on most Budapest postcards and travel brochures: a must see anyway). GPS coordinates of Szechenyi Baths. I got lost in the labyrinth of the huge Szechenyi Baths. Where am I? Please print out our internal map of Szechenyi Spa Baths to help you navigate around the maze of pools, saunas, steam rooms, long corridors of cabins and massage rooms, etc. The building is enormous, and it is best to have a little map with you, if you feel uncomfortable in unknown places. 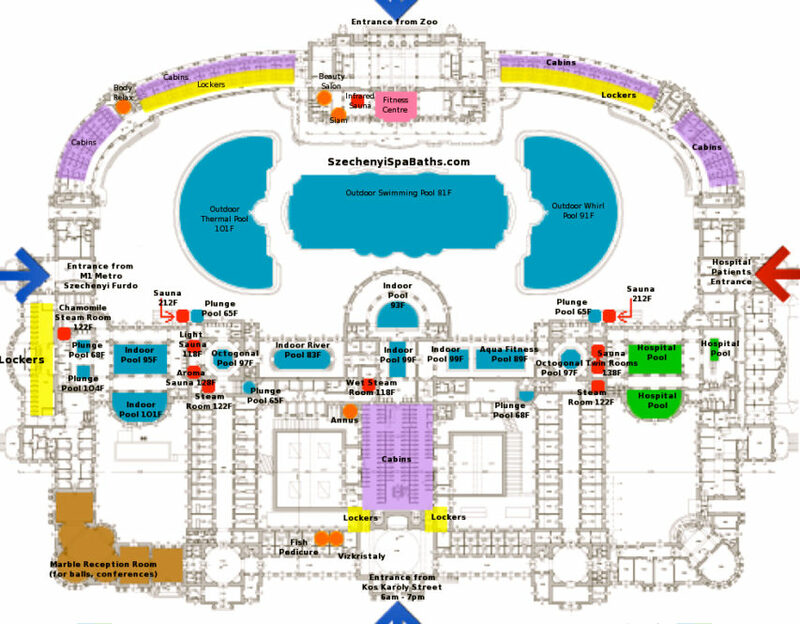 If you buy our online ticket, you will be given your own Szechenyi Bath Map to help you navigate more easily. When is Szechenyi Baths open? Some units close earlier, while others are open longer. The indoor facilities and pools are open from 6 am to 7 pm every day of the week, and the outdoor facilities and pools are open from 6 am to 10 pm every day. Szechenyi Baths is also open on national holidays and bank holidays, 365 days a year. However, the thermal baths may have shorter opening times on holidays. When are there guided tours in Szechenyi Baths? Every day, by day in the peak hours. Szechenyi Bath Tours are very short (approx. 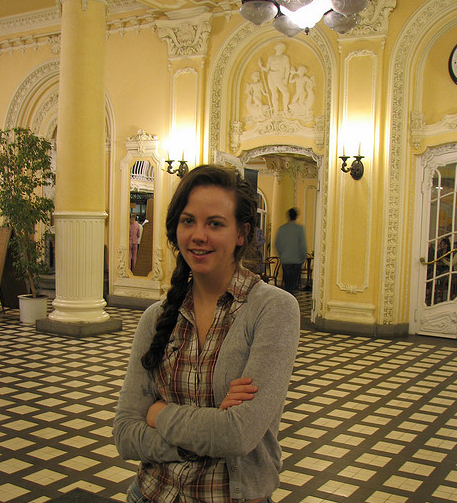 15 minutes) where you can take a look around the pools, the richly decorated lobby, reception hall, etc. See more details about Szechenyi Tours for visitors. 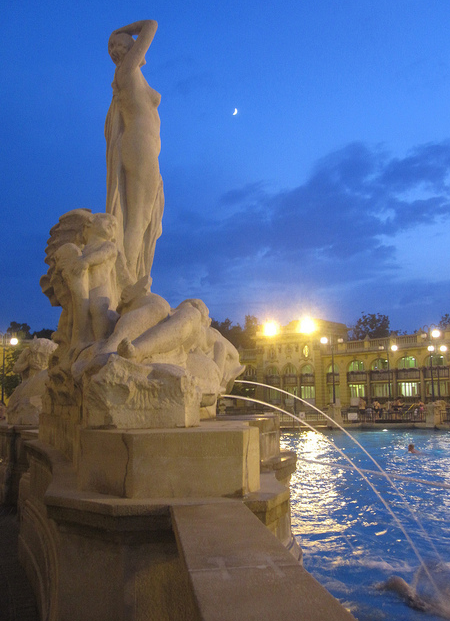 Can I visit Szechenyi Baths at night? The indoor pools, saunas and steam rooms. (in one word the so called Thermal Section) close at 7 pm. So if you want to enjoy the indoor facilities, we recommend timing your arrival at the Szechenyi Baths at 4pm – 5pm to have at least 2-3 hours for getting to the building, queuing for your tickets (you can buy your fast track bath ticket and entrance via our booking form on the left), getting changed, finding the pools you wish to enjoy, getting ready to leave (shower, hair wash, etc.) and checking out of Szechenyi Baths. When can I go in the morning to Szechenyi Baths? The earliest time to visit Szechenyi Baths is at 6 am. If you are an early riser or you just need to cure your headache after an all night party, you will enjoy Szechenyi Baths. Yep, early risers are absolutely welcome. After all, Szechenyi Baths is in fact ‘Szechenyi Thermal Baths and Pool’ with a big swimming pool for doing laps too (trainings are typically in the morning). 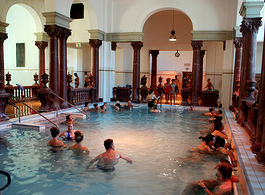 In addition, Szechenyi Baths is also a medicinal institute of aqua therapy, healing with its water, and some patients who have been prescribed its waters can enjoy the baths earlier. Hospital patients have separate pools and separate entrance. Please note that some of the spa treatments and aqua therapy, like mud treatment, is only available for hospital patients and not for the general public. What is a Cabin at the Szechenyi Baths? And what is a Locker? Why is a cabin more expensive than a locker? Can I not buy a ticket with a locker (or a cabin)? Cabins are private changing rooms, which are used for getting changed and also storing your belongings. Lockers are storage boxes, the average lockers you would find at a train station, for instance. Lockers are usually man size, so you will have ample room to keep your swim gear, street wear, shoes and a bag / backpack. What are the baths and pools like at Szechenyi Spa Baths? See our printable Szechenyi Spa Baths Map here in Fahrenheit or in Celsius with all the important info of the baths, pools, saunas, massage rooms, steam rooms, etc. There are 18 pools of various sizes and temperatures: 1 big swimming pool in the open air, flanked by two outdoor thermal pools, one of which has a fun whirlpool. The 15 indoor pools are bigger and smaller pools with different water characteristics, temperature, underwater jets, shape, etc. What are the ‘sparties’ / Szecska spa parties? Read more about the Szecska Saturday night parties here. 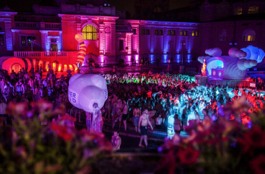 Saturday night laser show and DJ parties in the baths. Very popular, very unique, only in Budapest! What is the Dress Code at Szechenyi Baths? 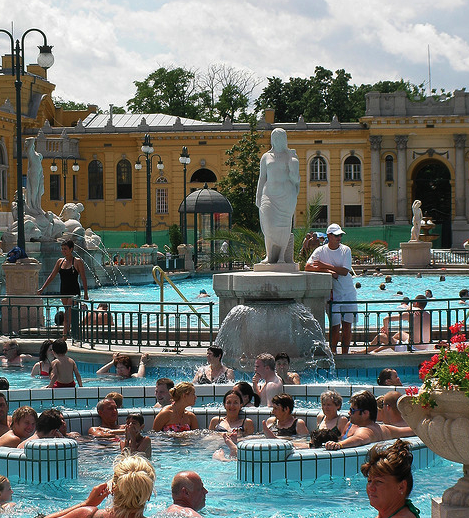 The dress code of Szechenyi Bath is very simple: please wear a swimming suit, bikini, speedo, etc. at all times, in all pools, and all bath facilities. Swim wear is obligatory. Flip flops are warmly recommended, as the soles of flipflops, slippers, barefoot guests, who come and go in the pool areas, leave marks on the floors. There are far too many guests in the thermal baths to keep a spotless floor all the time. The bath is huge, and there are hundreds, often thousands of guests inside Szechenyi Bath. It is best to protect your feet with light flip-flops. If you have no flip-flops, you can buy a pair in the main hall in Szechenyi Bath. How can I get to Szechenyi Spa Baths? The easiest way to get to Szechenyi Baths (or Szechenyi Furdo in Hungarian) is by taking the historical M1 metro (the 2nd underground in Europe, built right after the one in London!). M1 is the yellow line, which runs right down under Andrassy Avenue from the city centre. There is a metro station right by Szechenyi Spa Baths. The name of the metro station is the Hungarian name of the spa: Szechenyi Furdo (say: ‘Say-chain-nee Fur-der’). How do you say Szechenyi Baths in Hungarian? Széchenyi Fürdő is pronounced Say-chain-nee Fur-der. It is also called Széchenyi Gyógyfürdő (Szechenyi Medical Baths), Say-chain-nee George Fur-der, or even Szecska (setsh-kah) as a term of endearment. Yes, we Hungarians love our Szechenyi Baths. We are visiting Budapest between the 10th April and the 13th April 2018. I have read somewhere that the outdoor pools will be closed, is this all three of them or just the whirlpool bath? 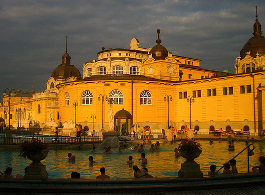 Is it necessary to know swimming for visiting szechenyi bath? no, it’s not necessary, as most of the pools are not deeper than 100-110 cm. Hi, how deep are all of the thermal baths? I am wanting to come tomorrow and to book my tickets online, am I ok to show tickets on my mobile or do they need to be printed out? yes, it is enough if you can show the tickets on your mobile phone. Hi, can you confirm the temperatures of all of the pools, please? Hi, thank you very much for your help! Hello! Can you use a credit card to purchase tickets directly at your location (not online)?